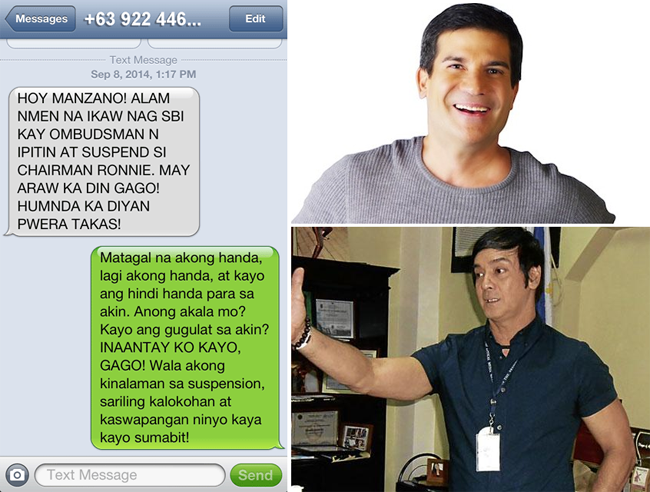 Edu Manzano exposed death threats from alleged Ronnie Ricketts’ cronies which started out when he was wrongly accused of being the reason for the suspension of Optical Media Board (OMB) Chairman. On his Twitter post last Tuesday, September 9, Manzano shared to his followers the anonymous text message he received. According to the message, Manzano influenced Ombudsman Conchita Carpio-Morales to suspend Ricketts as chairman of OMB. This was rooted in the issue of Ricketts lax characteristic on his job. It has been discovered in an investigation that Ricketts released boxes of confiscated pirated VCDs, DVDs, and video recorders. These material were said to be confiscated from Sky Marketing Corporation in a post raid operation on May27,2010. Theses details led to filed cases against Ronnie Ricketts and other OMB officers who was said to violate Republic Act 3019 or Anti-Graft and Corrupt Practices Act. On september 8, at 1:17 pm, Manzano received a threat message. It pointed that it was Manzano who told the Ombudsman about Ricketts’illegal actions. The message made clear that they are planning to have their revenge. Manzano refused to be threatened and replied, saying that he would always be ready. He even clarified that he had to involvement on the issue. <Part 1> To all the Ricketts cronies that are harassing me: WALA AKONG KINALAMAN SA SUSPENSION NG BOSS NINYO. Since 2009, I have not had..
<Part 2> ..anything to do with the OMB. In the first place, EXPIRED na ang appointment ng boss ninyo, at HOLDOVER capacity na lang siya..
Base on the Twitter post of actor and host of TV5, he had never been a part of OMB since he stepped down as chairman in 2009. He does not have anything to do with the issue on Ricketts’ ans it was the fault of the accused to be in trouble now. He even explained the Ricketts’ term had already been expired since April 2003, and the position is already open for the next chairman.